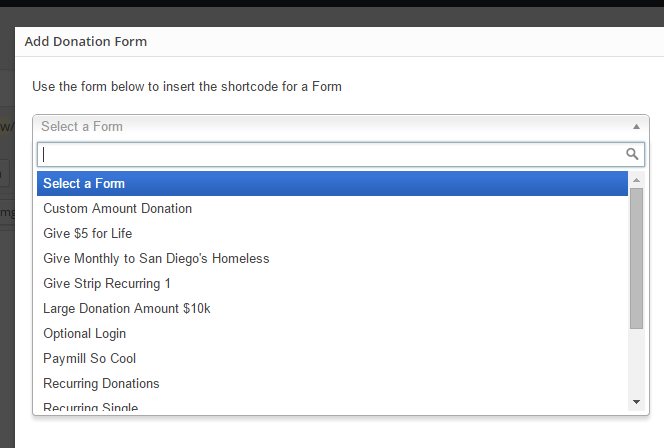 The [give_form] shortcode allows you to insert a donation form anywhere on your website. 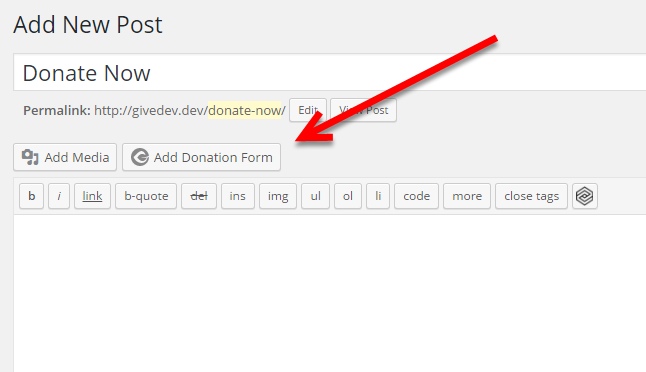 Give also includes a shortcode builder which will make this process even easier. 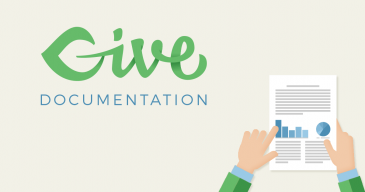 Each Give donation form you create has a unique ID which the [give_form] uses to select the appropriate content to insert. If the ID field is missing nothing will output (or you will see an error message if you have debug turned on). The "id" is a required attribute for this shortcode. 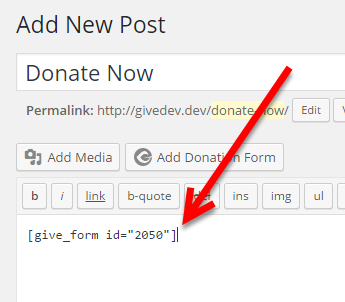 The "id" should be the post ID of a published donation form. Using the shortcode builder is the easiest way to embed a donation form on a page or post. 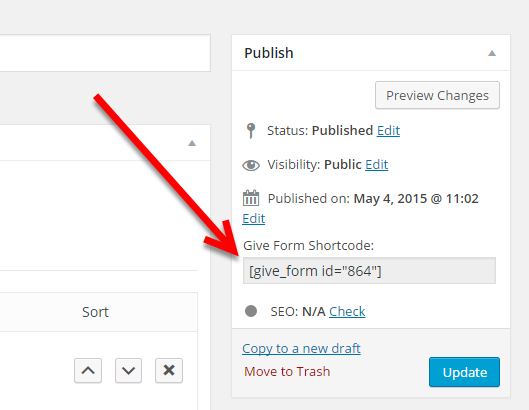 To begin using the Give shortcode builder first navigate to the page or post you wish to insert the shortcode into. 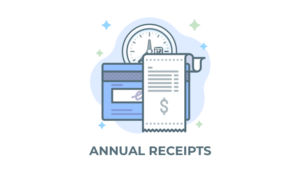 Once you’ve chosen your form from the list, you have several options to customize the display of this form on your page. Note that each of these settings is optional. If you do not choose any of them, the defaults will be used instead. 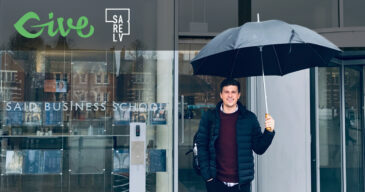 Show Title — optionally show/hide the form title. Default is “true” which means the title will show by default. Display Options — this is the Display mode setting. Optionally override the setting you set when you created the form. 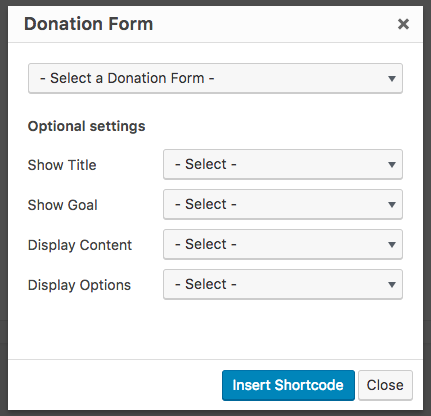 You can choose from “All Fields” to display all fields on the page when it loads, “Modal” to display fields in a modal button that shows only the title and total before clicking the button, “Reveal” which shows all fields on the page after a click, or “Button only”which puts all fields within the modal, and only has the “Donate Now” button visible. Once those are all set, click “Insert Shortcode” and you’ll see your shortcode inserted into the editor directly. show_goal: This allows you to display the form with or without the goal. The default is “true,” for forms with a Goal enabled meaning that it will show the Goal unless you set this value to “false” within the shortcode, like this [give_form id="43" show_goal="false"] but if the form does not have a goal, this parameter is disabled and will not affect the output. show_content: This allows you to display the form with or without the content. The default is whatever is set in the form’s settings for forms with content enabled meaning that it will show the content unless you set this value to “none” within the shortcode, like this [give_form id="43" show_content="none"]. To override the settings via shortcode, your options are above, below, or none. If the form does not have content, this parameter is disabled and will not affect the output.